Trigger, I am trying to decide what to do on my car as well. I have tinted the fogs, 35% windows (NC legal), tinted tails. I think I am going to have a custom emblem made replacing the GT on the faux gas cap. Going with the intertwined V8 I think. 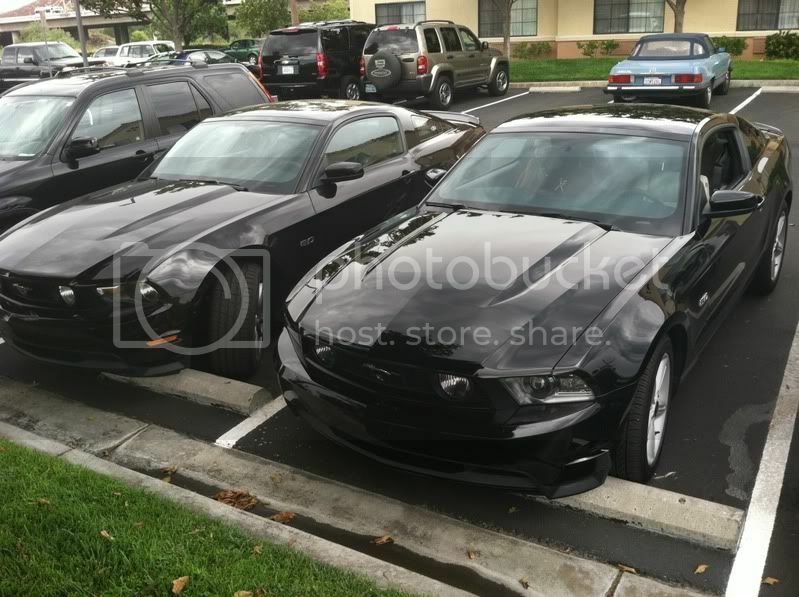 My options are (1) hood spears and decklid panel, (2) the super snake stripe (wide with pintripes on the side in charcoal) or (3) leave it as is. Forgot to add this pic. Those the stock headlights? They seem darker. Yes, stock headlight. Put 50% tint on my fog lights though. Hey guys just got my white '10 a few weeks ago and I want to tweak a couple things, wanted to know what you thought. I am thinking about getting some smoked tail light, 3rd brake light, turn signal light, and 1/4 marker light kits from American Muscle, the website that is. Do you guys think that would be cool? Then I was planning on doing window tint, Maryland allows 35% legal, so I think I'll go to 20% or so? Hmmmm? I also am kinda stumped on stripes. I want my car to be different, not like the typical two stripes from hood to trunk. But maybe thats the better option? Or do you guys like one big? Two with the smaller border ones? Not entirely sure about what i want to do. I was thinking also maybe of getting custom rocker stripes made. That say "Trigger" in them but with the Mustang font? Anyone know where I could order that from? And finally I really want and Autobot symbol on my car, don't know if i want the little ones right behind the front wheel wells. But I KNOW i want the faux gas cap for the trunk. My problem is that i can only find a '05-'09 one that has the lock on it, I was wondering if that would still work, or even if there was a 2010 model. Let me know what you think guys and sorry if this is a lot and thank you in advance! I was under the impression 50% tint was totally legal in MD, and 35% is in the "gray area." So 20% is "pull me over." For me, I'd rather not risk getting nailed for tint and having to pay to have it taken off, and put back on. JMO. I originally had white stripes (hood -> trunk) but took them off. Matte black would look good on yours. I used VHT Niteshade on my turn signal/quarter panel reflectors. $10 as opposed to $50+. Nice gloss finish, and you can go as light or dark as you want. You can buy the roush rear emblem kit, it replaces the GT making it smooth so you can put your autobot decal on! Labor Day Savings at AmericanMuscle!